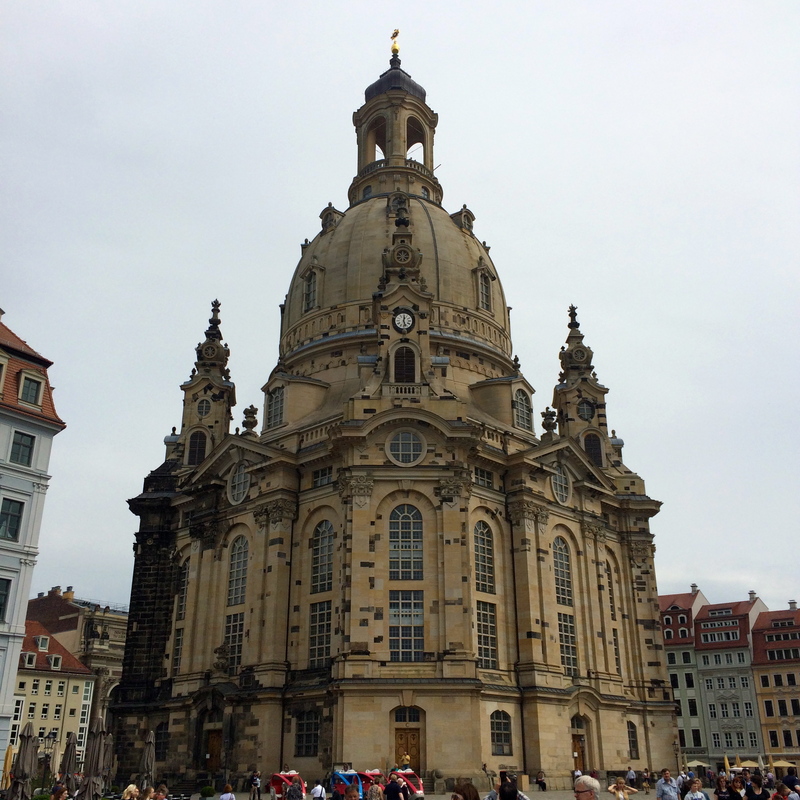 The Frauenkirche dome looks intimidatingly high but “climbing” it means taking an elevator up to that lower dome and then trekking the rest of the way. 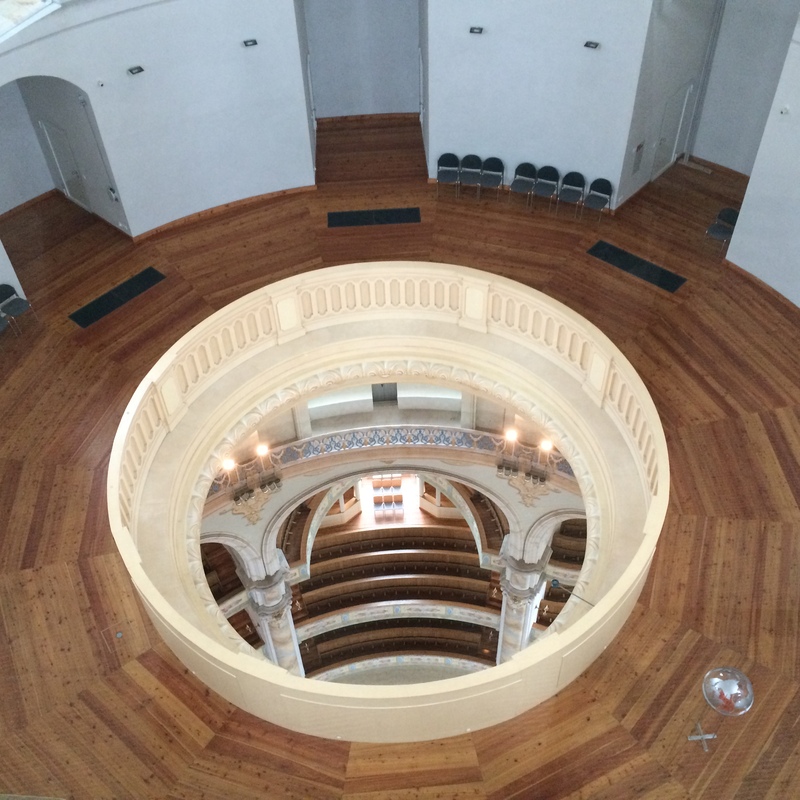 It’s an interesting hike because, like the Reichstag, it’s a ramp that runs around the inside of the dome circling an inner glass wall and giving you a glimpse down into the church far below. 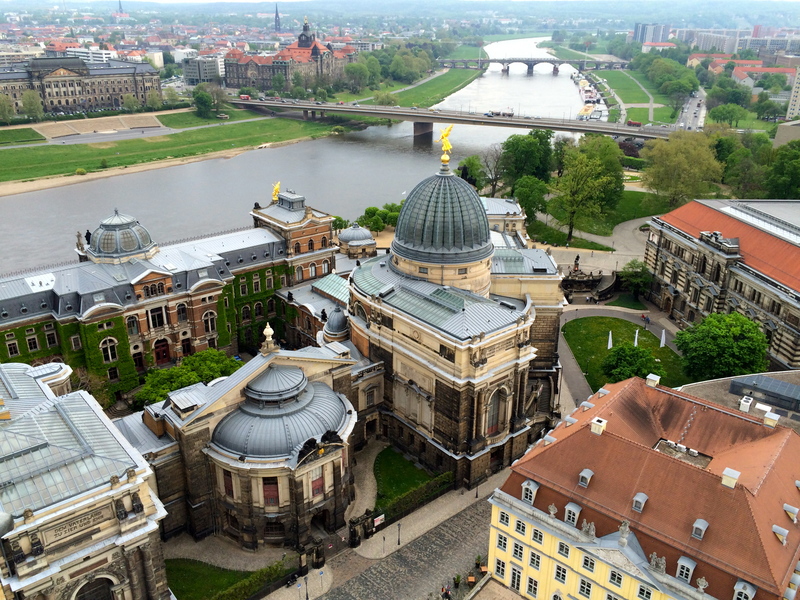 Dresden is a much prettier city from above than Berlin. 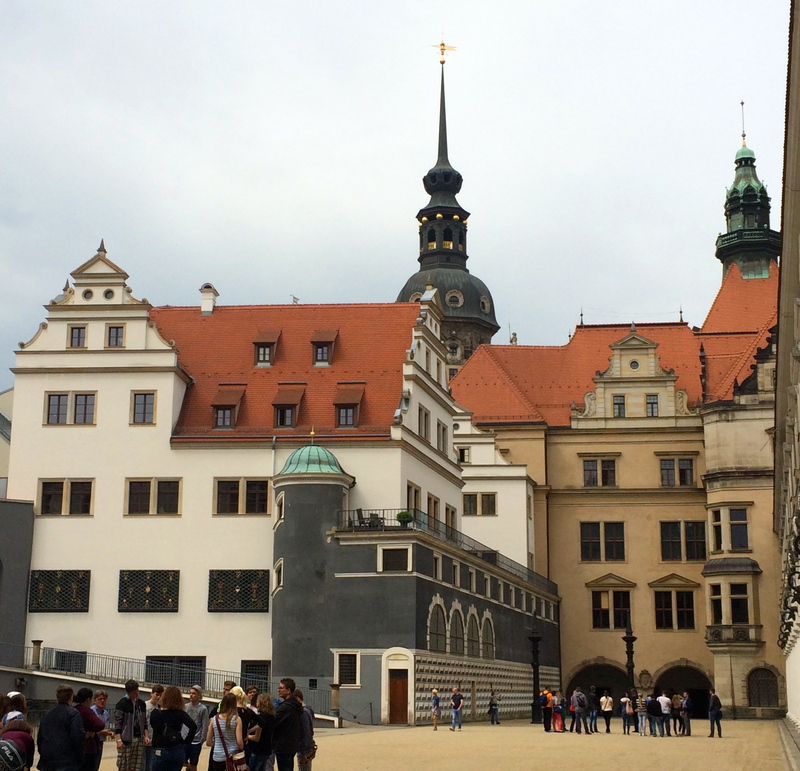 It’s fun to be in an old school European city with palaces and old architectural styles, even if they are reconstructions or blends of all possible styles. And then went over the Augustus Bridge. 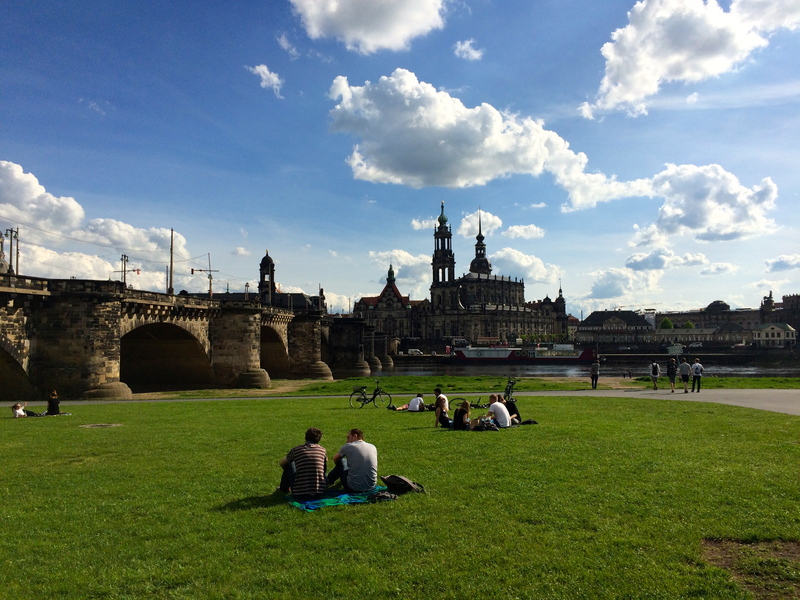 The day before I had gone down into the park for a little lounge by the Elbe River, the perfect spring time activity. 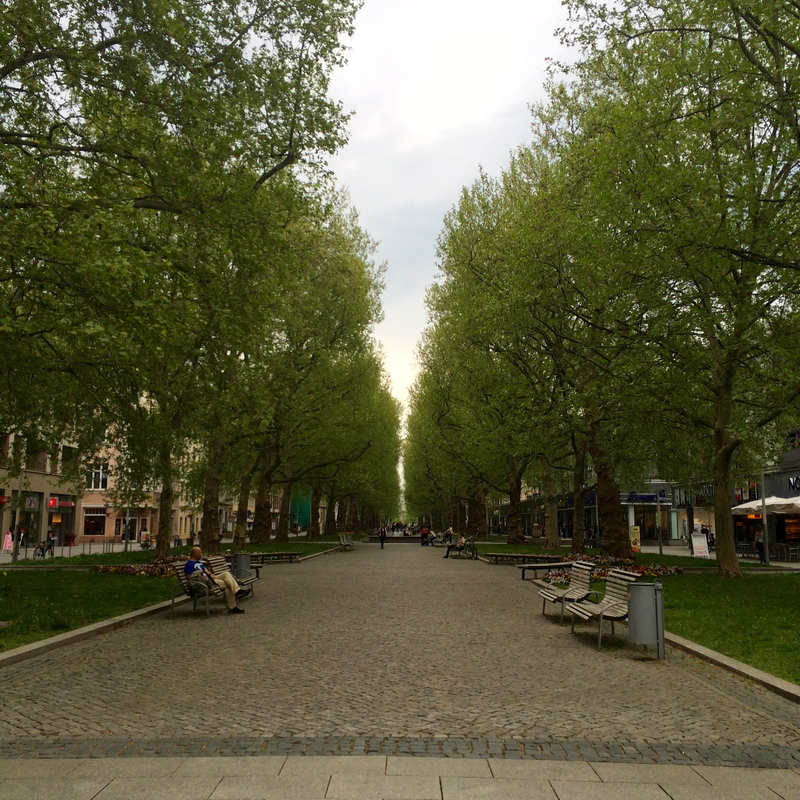 Look at the difference in the grey sky above and the sky below… That’s changeable springtime in Germany for you. 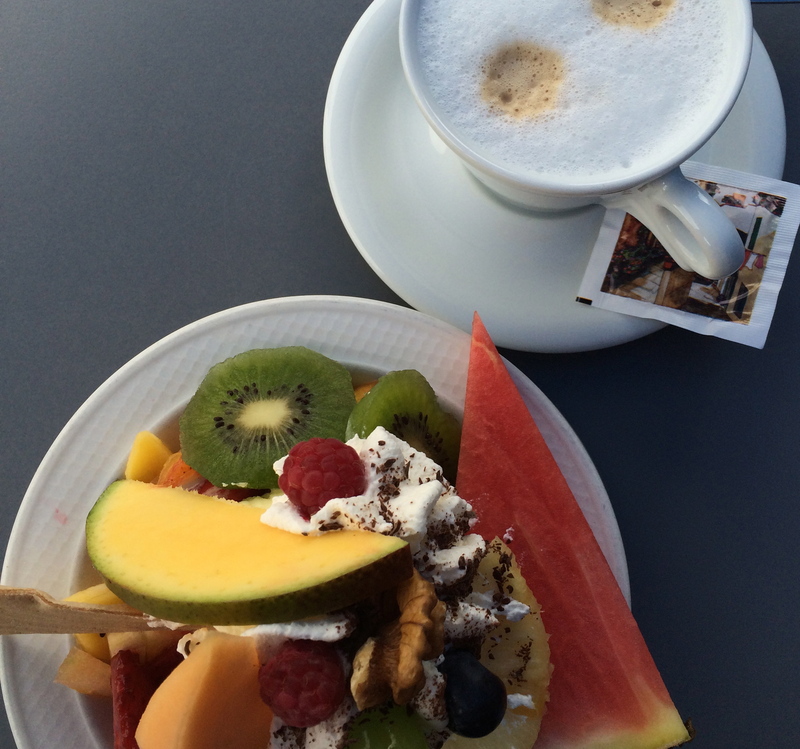 Ok, it’s mostly fruit – obstsalat – because I don’t love ice cream. But there’s vanilla ice cream underneath there! And a mid afternoon cappuccino like civilized folk do. 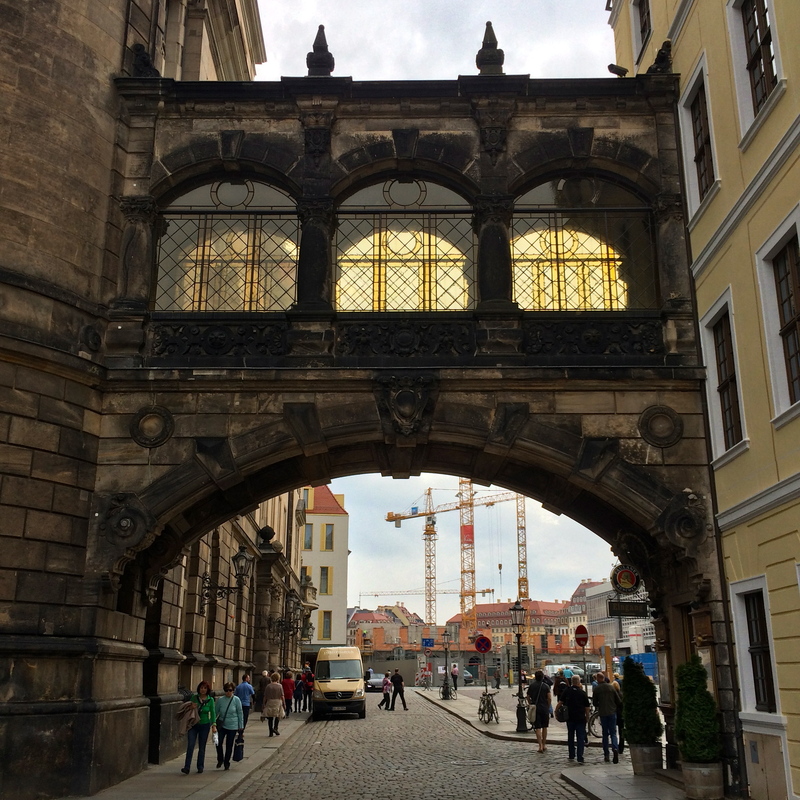 I finished my tour with a walk down the Hauptstrasse, the main street in Dresden’s New City. 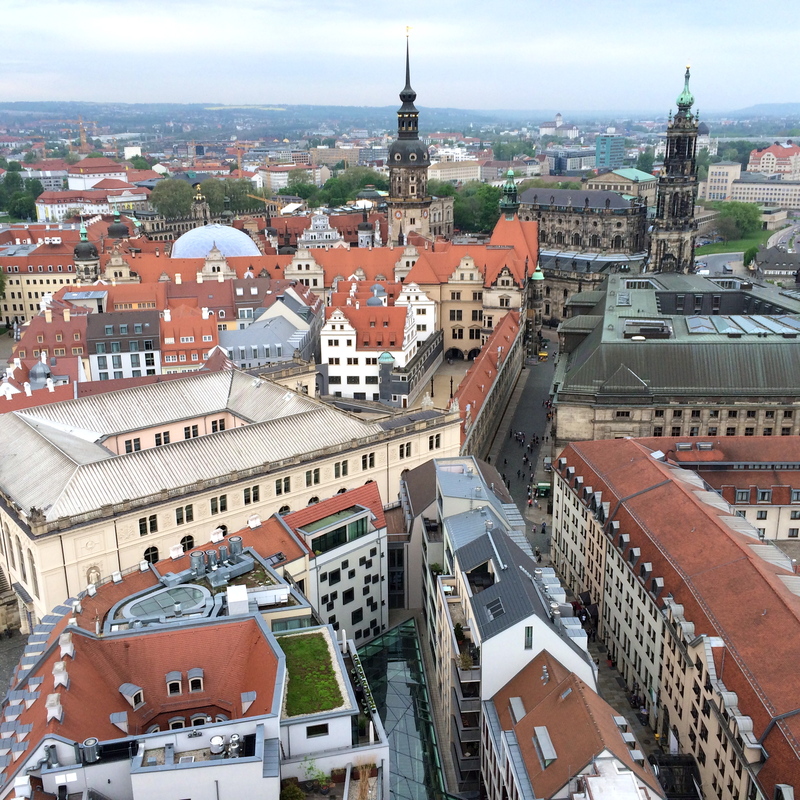 Unlike the Old City across the river, Dresden’s New City was mostly untouched by the firebombing but it’s also full of boring Soviet-era architecture so it’s not nearly as picturesque. However, this street is lovely and placid and all the shopping is over here, as are the better restaurants. 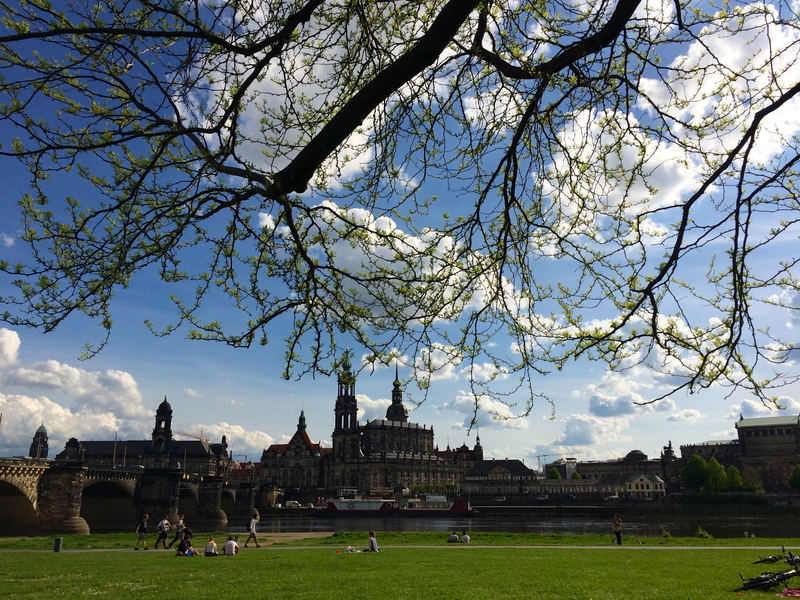 And that was pretty much the end of my Dresden day! I was feeling pretty good about this whole Dresden minibreak until I tried to get home and was informed that no trains were running. Apparently the Train Workers union is on strike this week? What the hell, Germany! And after I just celebrated your labor day too! I waited for a train that never arrived and thus missed a bus intended to replace the train, got scheduled on another bus, went to bus station but was told my bus was not there (Deutschebahn?? Nein! Nein!) so I missed that bus, desperately wished I spoke German, back to the train station, got scheduled on yet another bus and finally got on it while it was parked in front of a car rental place… naturally. Don’t know why that hadn’t occurred to me. Now I’m back in my little temporary home and I have a wine tasting tonight! More about Berlin tomorrow. 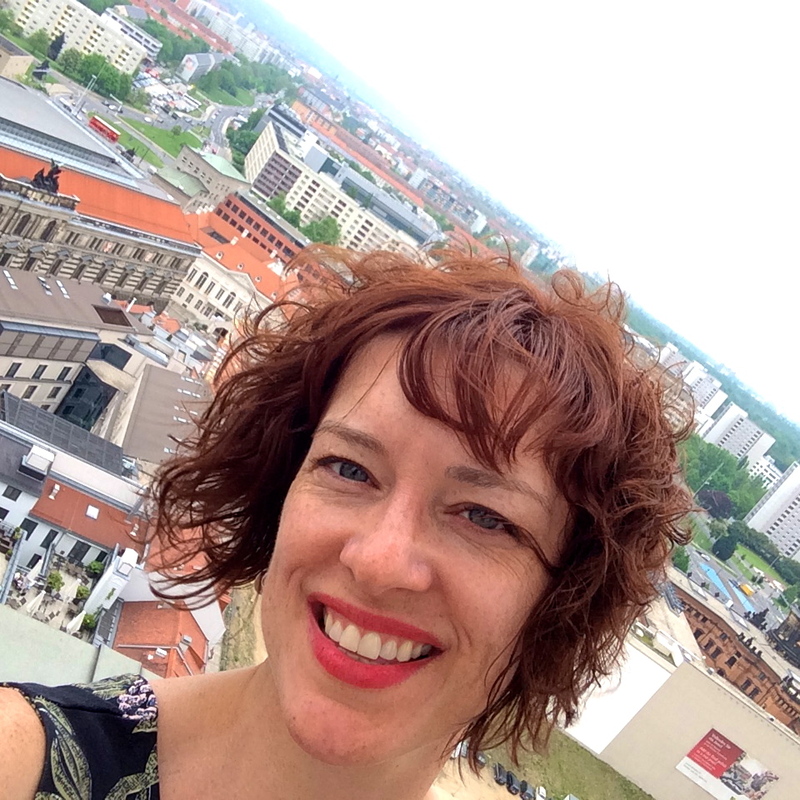 This entry was posted in Bus drama, Dresden, Germany and tagged climbing a tower, Dresden, Dresden Altstadt, Dresden Neustadt, Eiscafe Venezia, elbe river, Frauenkirche, germany, hauptstrasse, springtime lounging, train workers on strike, Views over Dresden. Bookmark the permalink.